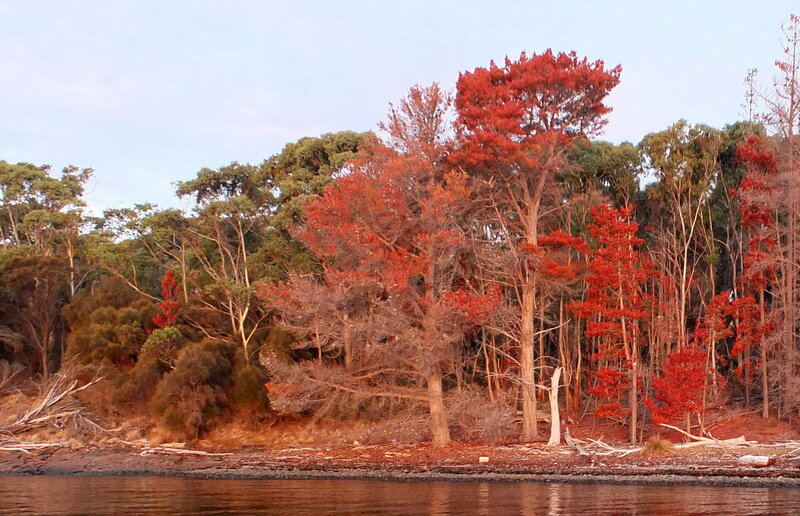 In late 2013, Bruny Island Lodge decided to undertake a massive and rather unique eradication project. Our aim was to control the radiata pine infestation which was threatening to overrun the native bushland at our 900 acre property on South Bruny; Bruny Island Lodge is home to a number of threatened native species of flora and fauna, including the swift parrot, the forty spotted pardalote and pretty heath. As an environmental weed these self-seeded pines ranged from immature saplings to very large mature trees. Working in conjunction with the Tasmanian Land Conservancy[i] a five year plan was developed to remove an estimated 80, 000 pines. Various methods were considered and advice sought from a wide range of both interstate and overseas sources before using herbicide by stem injection was chosen. And while this method has been carried out in New Zealand, it appears to be the first time on a large scale within Australia. Further advice revealed A Forest Practices Plan was required; this caused an additional cost to the project of $20,000*. The chosen methods ensured that minimal damage was done to the surrounding native species. Large trees were not felled, poisoning them standing using herbicide was deemed the best method, as this would also kill all the seeds that are still attached to the trees; create less habitat destruction and a lower bush fire risk. The herbicide is contained within the tree with no discharge into the environment, the trees die quickly and breakdown slowly as the surrounding forest regenerates. The second method was to cut off any pines whose trunks at the base were less than 12 cm diameter. These don’t need any herbicide to kill the plants, as long as they are cut below the first green leaf. The pines grow quickly, so any seeds that had already germinated would be a foot or higher each continuing year making live trees easier to identify. The property was divided into zones and the teams walked lines throughout each zone, searching for any pines that were then treated. Along the shoreline only 50% could be killed each year to minimise the visual impact from across the water. Two months after the initial control work, the extent of the project was apparent with vast areas looking like deciduous trees in autumn. Now in the final stages of the project we can confidently say that the aims of the project were maintained with minimal impact on the surrounding native vegetation, and a successful outcome was achieved with the removal and eradication of over 80,000 pines. 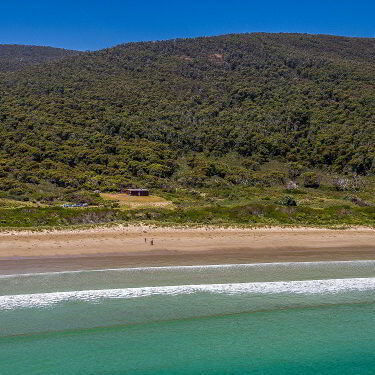 We are very proud to say that in future Bruny Island Lodge near Cloudy Bay can continue to be the natural habitat for some of Bruny Island’s threatened native species of flora and fauna and the endemic birdlife that we and visitors enjoy. Tasmanian Land Conservancy; Jane Hutchinson, CEO TLC (Australian of the Year 2016 finalist); Bruce Hay , former Manager Central Highlands TLC; Denna Kingdom, Reserve Manager TLC; Woodstock Forest Services, Scot Rigby Operational Manager and his team and Andrew from Just Trees Hobart. *(TLC, recommends “Future Tasmanian projects of a similar scale should work closely with the Forest Practices Authority to determine whether a Forest Practices Plan will be required). [i] The Tasmanian Land Conservancy’s mission in partnership with others, is to look after Tasmania’s unique natural places, rare ecosystems and habitat for threatened plants and wildlife on private land. The Tasmanian Azure Kingfisher is endangered and endemic to Tasmania, and very rarely seen on Bruny Island. From the ramblings of a meandering mind, today I am wondering if the appreciation of nature is an intrinsic part of our soul or is something that we choose to acknowledge. Congratulations to Amy & Kim on getting married. They held their wedding ceremony and reception at Bruny Island Lodge.